"This is really two recipes in one - 6 cups of brandied fruit, and 2 cups of starter for the Thirty Day Friendship Cake." 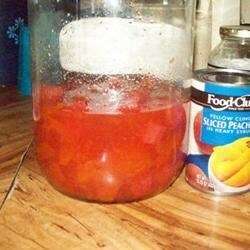 In a large glass jar, combine drained pineapple chunks, drained apricot slices, drained sliced peaches, drained maraschino cherries, brandy and sugar. Stir gently with wooden spoon. Cover and let stand at room temperature for 3 weeks, stirring at least twice a week. Drain and reserve the liquid - This liquid is your starter for the Thirty Day Friendship Cake. See how to make a scrumptious, berry-filled, no-bake cheesecake. The brandied fruit should be kept refrigerated, and can be served with ice cream, yogurt or pound cake. You can also use the brandied fruit in a cake mix or scratch cake. Use about 2 cups (chopped) per cake mix. I make this every year at thanksgiving, and again at christmas. Here's a tip, If you don't want to make so many cakes, the fruit started is delishious on vanilla ice cream. Enjoy!